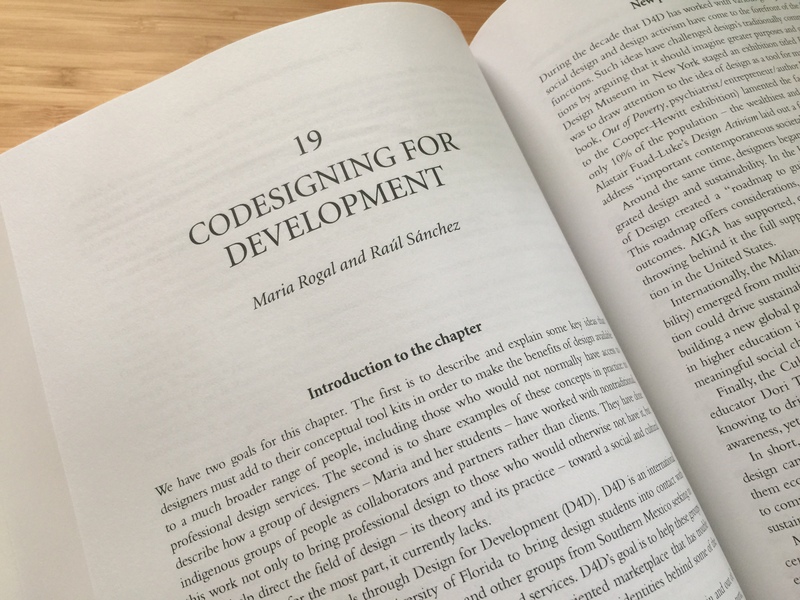 Raúl Sánchez (UF English) and I published an essay, “Co-Designing for Development,” in the Routledge Handbook of Sustainable Design (ed. Rachel Beth Egenhoefer). Our essay uses my decade-long design research initiative, Design for Development, a collaboration with indigenous entrepreneurs in Mexico, to explore its theoretical, conceptual, and practical contributions to the global conversation on sustainability. We have two goals for this chapter. The first is to describe and explain some key ideas that designers must add to their conceptual tool kits in order to make the benefits of design available to a much broader range of people, including those who would not normally have access to professional design services. The second is to share examples of these concepts in practice: to describe how a group of designers – Maria and her students – have worked with nontraditional, indigenous groups of people as collaborators and partners rather than clients. They have done this work not only to bring professional design to those who would otherwise not have it, but also to help direct the field of design – its theory and its practice – toward a social and cultural perspective that, for the most part, it currently lacks. We approach these goals through Design for Development (D4D). D4D is an international initiative Maria began at the University of Florida to bring design students into contact with indigenous entrepreneurs, farmers, artisans, and other groups from Southern Mexico seeking to tell their collective stories through their products and services. D4D’s goal is to help these groups succeed – on their own terms – in a crowded, tourist- oriented marketplace that has trouble understanding and valuing the profound knowledge and vibrant identities behind some of the items it offers for sale. D4D begins with Maria. She is a communication designer with experience in and out of academia and a design educator with an international orientation and reputation. In turn, Raúl’s experience and knowledge lie in the humanities, specifically the areas of rhetorical and critical theory with a recent emphasis on decolonial studies. Together, we hope to give readers a comprehensive look at the ideas, practices, and goals of D4D. And we hope to place this information in contexts that can inspire the thinking and practice of contemporary design students and educators. We will begin by discussing some of the theoretical and methodological concepts informing D4D. Then we explain the concepts and practices of D4D in light of decolonial theory and methodology. We continue with a brief description of the region in which D4D operates, the indigenous culture within it, and the issues faced by members of that culture. Finally, we will present two case studies of D4D projects – the Lol- Balché honey cooperative and the Xyaat community ecotourism cooperative – that reflect the concepts and practices described.